Grace personified ! Sole authorship here. Carving and gold engraving galore. This is a double action AND credit card knife. The subtlety of the covert mechanics are hidden in an outstanding piece of sculptural art. Who would know? 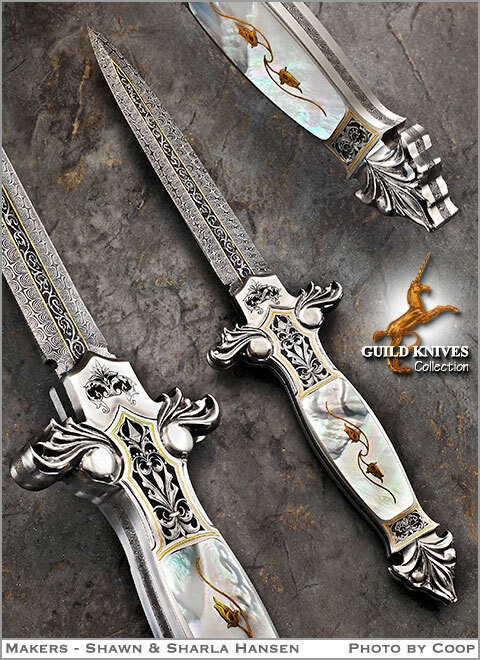 Of the approximately 10 knives a year coming out of Hansenâ€™s atelier, this is one of his best and most complicated pieces. Unquestionably of Investment Grade. Hansen three bar damascus with gold inlay. Hidden trap door release that is invisible to the eye, being set into the engraving of the bolster.